Exposure: Exposure: 20 x 10 min (1x1 bin) exposure with UV/IR block, 14 x 12 minutes (1x1 bin) exposure with Hydrogen Alpha filter, 8 x 4 min (2x2 bin) RGB exposures. Processing: Data Collection - Sequence Generator Pro (as FITs). Calibrated, stacked (Kappa Sigma Combine) - Deep Sky Stacker. LRGB channel registration, equalization and gradient removal - Astroart. Curves, Levels, RGB combine - ImagesPlus. Luminance Layering, final stretch, and finishing - Photoshop. RGB calibration - eXcalibrator. This image is a RGB combine with Luminance layering. Color saturation in LAB color. The H-Alpha filter exposure was screen blended into the IR/UV Blocking filter exposure stack and used for the luminance layer. Ha was screen blended into the Red channel - emission balance of RGB done with Channel Mixer in Photoshop as best as possible given the bright star blue gradient. Images processed at 3352 x 2532 resolution. Final Image size is approximately 2800 x 2100. North is to the left in this image. 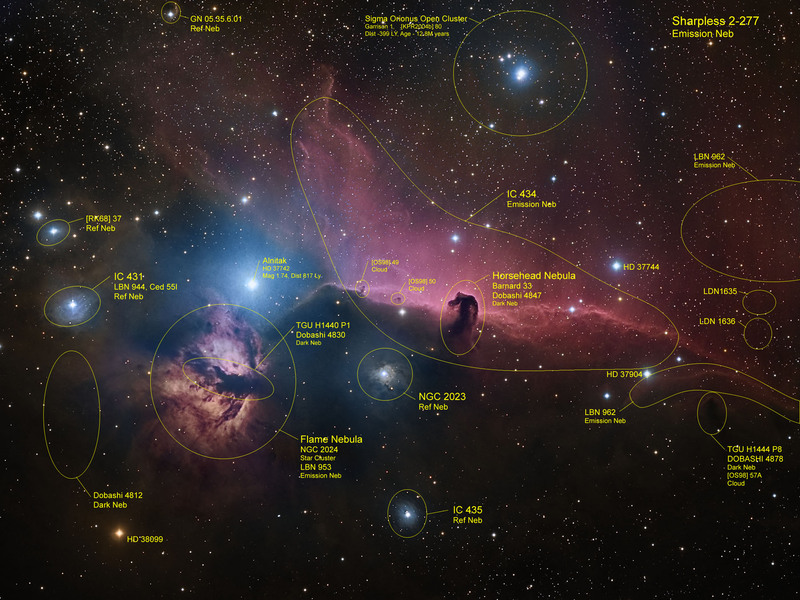 This field is the iconic Horsehead / Flame Region in Orion. 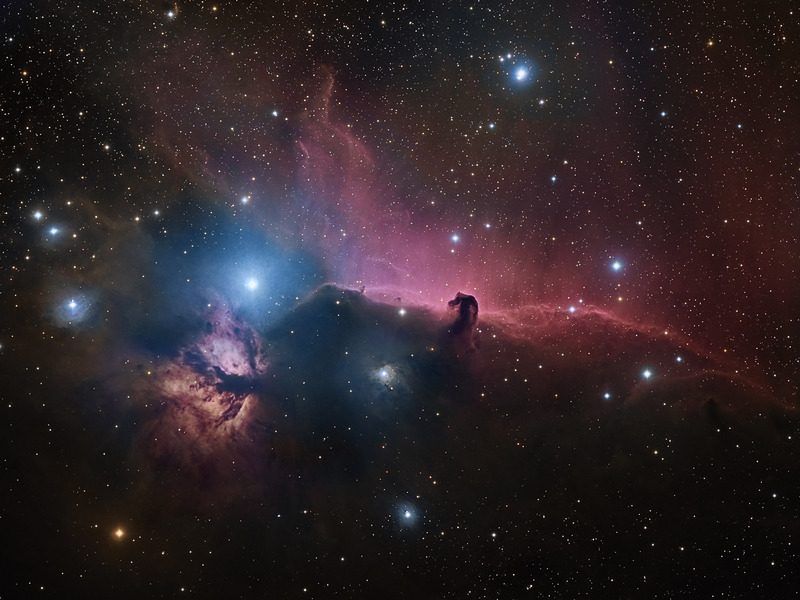 The Horsehead Nebula (Barnard 33) is silhouetted by the emission nebula IC 434. The Flame Nebula (LBN 953) is involved with the star cluster NGC 2024. This region is part of the Ori B Molecular cloud star forming region which spans about 360 arc minutes of sky (about three times the field of this image). This whole field of emission area is also known as Sharpless 277. There are several reflection nebulae in this field - notable are IC 431, IC 435, NGC 2023, and [RK68] 37. Besides the Horsehead nebula (B33) there are several other Dark Nebulae and clouds in this field. Also, the Sigma Orionus Open Cluster - a young star cluster of 12.8 million years - is in this field. This cluster is not in traditional astronomical catalogs but has been the subject of some study in the past few decades. These objects and some of the brighter stars are identified in the annotated image. This image replaces an earlier image in the Archives here Horizontal FOV is approximately 120 arc minutes. Image center is approximately - Equatorial 2000: RA: 05h 41m 02s Dec: -02°18'19"